Submissions & Contact - SAINT JULIAN PRESS, Inc.
Saint Julian Press as a literary and educational organization embraces a vision to create a local and worldwide community through engaging in an artistic and literary dialogue that promotes world peace through cross cultural and interfaith conversations. In our mission as a new creative imprint we hope to identify, encourage, nurture, and share transformative literature and art of both past and living masters. While giving emerging artists, poets, and writers a place they may come home to and share their work; celebrating the enduring mystery within creation that calls us into relationship with one another. ​New submissions are closed at this time until late 2019 or early 2020, since we have several publication projects already in flight. We will place an announcement here when someone may submit a new manuscript. Saint Julian Press has only one annual reading period. We are not accepting new submissions until late 2019 or early 2020. In the past we have accepted some submissions during the year, but it has become too hard to do this and publish new books too. Please look here for future announcements on when submission will open up again. After an initial acknowledgement, please expect an eight to twelve week response time overall, it simply takes time to hold several conversations in place, especially when new books are in the works. Due to considerable ongoing business and publication expenses, Saint Julian Press charges a non-refundable $50 reading and review fee for full-length collections (55-120 pages). Any manuscripts or books longer than 120 pages should be submitted with an $80 fee. 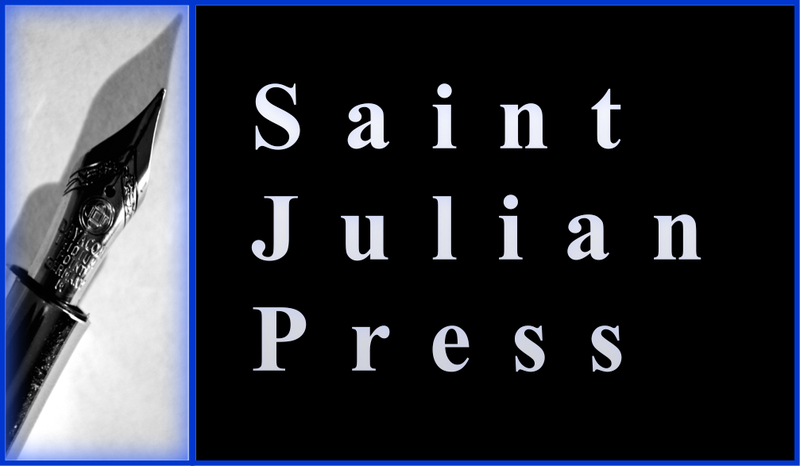 Saint Julian Press follows a non-traditional innovative literary press publishing model that works intimately with each artist and author. This is not a fee for service or commercial publication model. It is art, in the highest sense of that word, and a creative partnership between the artists, poets, and writers who sincerely wish to work with Saint Julian Press. In the end, it is a literary endeavor, one we enter together for the pure pleasure of art and writing that will help transform the world, our world. Please send in your reading fee via the PayPal Button right below, or by check if you wish to the address shown at the end of this page. Please submit any book submissions for consideration via the email link below. We are looking for poetry that is well written, engaging, has great literary style and potential, values all human diversity, and is a reflection of our core mission and vision. Please go to the Saint Julian Press homepage to learn more if you have not already. Order a book or two to understand the diversity of those authors/books we've published. As we learn about new and emerging writers/poets from our creative partners, they may be invited to make a book submission or as a guest author on the website. We try our best to leave the process open and flexible. On an annual basis we select and work closely with new emerging writers/poets to help sponsor and underwrite the cost to publish their first book of poetry or prose. Look at what Saint Julian Press has already published, order a book. Read the author checklist before submitting. Electronic submissions via email are a requirement with today's technology. We will acknowledge receipt of your submission within 2-3 weeks. We will contact you regarding the status of your submission within ten to twelve weeks. Send an Email with author’s full name in subject line, followed by manuscript title. Confirmation number of PayPal reading/entry fee transaction. Include a cover letter with author’s full contact information. Include a biography of about 250 words or less, less is more. Include prior publication credits for poems/stories from the manuscript. Attached manuscript file in a PDF, Word .doc or .docx, or .txt format. A contract will be sent to the author via eMail or Regular Mail if preferred. Once a contract is signed, publication dates will be determined individually by author and book. New Submissions Form - Please note that new manuscripts must be submitted as an attachment in a separate email using the SJP email address at the end of this page. After an initial acknowledgment of your submission you may expect and overall eight to twelve week response time. We may also ask you to provide more information about yourself and writing, and schedule some time to visit together. You may also contact us by sending an email.